We provide returns and exchanges of product purchased due to damage, defect and change of mind within 7 days from the date of product received. To initiate a return, kindly contact us at sponline94@gmail.com or +6016-3371672 with your order number before sending the returned products to us, we will advise you accordingly. 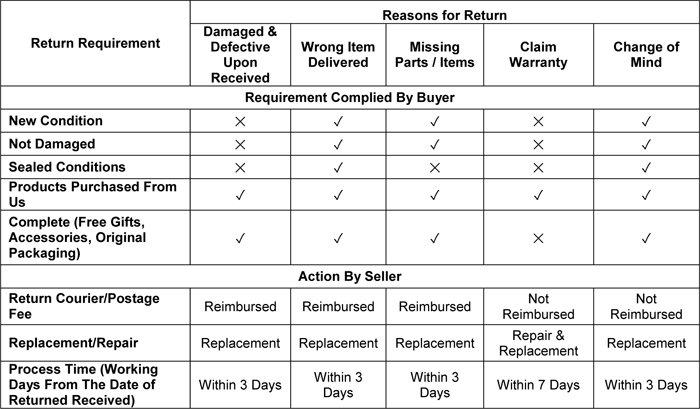 Once we have checked and verified the returned against the requirement, customer will received their replacement within working days as stated in the table above. Refund will only take places when there is no available similar replacement product. Kindly take note that we will not be responsible if your shipment is lost during the return transit. In the unlikely event that your return does not meet the requirements and the products has been used or damaged by customer, we will notify you before sending it back to you. In this instance, there will be no refund/replacement and your return courier/postal fee will not be reimbursed. To initiate a warranty claim procedure, kindly contact us at sponline94@gmail.com or +6016-3371672 with your order number before sending the returned products to us, we will advise you accordingly. Kindly take note that the courier/postage fee to return the product for warranty claim shall be borne by customer and we will bear the courier/postage fee to resend the repaired product.. In additions, we will also not be responsible if your shipment is lost during the return transit. In the unlikely event that your return exceed the warranty coverage period, we will notify you before sending it back to you. In this instance, the delivery fee to return the over-warranty product shall be borne by customer. Refund will only be initiated when the product purchased are out of stock.